IT IS ALMOST HERE. SEPTEMBER 29th 11 AM – 5 PM. The Designer at Slattery Builders has staged the entire home and all of the items are FOR SALE!! An extravagant promotion of Slattery Builders newest Floor Plan. It is unlike any other home in Fort Wayne, Indiana. Enjoy shopping model home decor, Music, and Food Truck for lunch! The home is located in the Edenbridge Subdvision on Coldwater Road just North of Ted’s Market @ 13619 Four Elms Trail in Fort Wayne. You can check out more information at slatterybuilders/facebook page. Welcome to the new year. Slattery Builders is so excited about all the new designs for 2018. We have 2 amazing Model Homes that we have designed and perfected for the new year. We will have sneak peaks on these homes shortly. We still have our wonderful Home in Whisper Rock for sale. If you have not toured this home, you need too! Each part of the home is custom and well thought out. We have wainscoting in the foyer that opens to the dining room, dressed with crown molding and elegant wall trim molding. The detail is repeated in the oversized master bedroom. The floor to ceiling heavy stone fireplace is balanced with a coat of white and windows framing on either side. The Great Room transitions to the nook/kitchen area, with an open block transom overhead, providing the perfect marriage of spaces. the light and white kitchen features white with gray veined quartz counter tops, large island, walk in pantry, and an entire wall of windows above the sink basins. This model offers 4 Bedrooms, 2 full Baths, and another Jack n Jill, plus a 4th full bath in the full unfinished basement, walk in closets, back deck off nook, large laundry and locker unit with additional coat closet and covered front porch. Call to take a tour or we provided a video tour of this home below. Experience great construction, Great Style, and Great Life with Slattery Builders. Come out to our Design Center on Dupont Road for Happy Friends-giving time. We have a window full of what everyone is thankful for. Write down something you are thankful for and grab a selfie at the same time with our Thanksgiving props. Tag us (Slattery Builders) and Just Cream on social media and we will pay $2.00 off your ice cream order at Just Cream. Offer ends 11/30/2018. 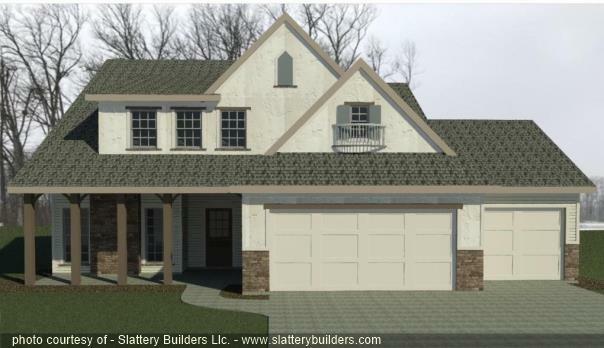 Show your post at check out and enjoy on Slattery Builders.